With its title inspired by the number of keys on the piano, this book portrays 88 tastemakers of jazz piano -- from visionary pioneer Jelly Roll Morton to the vital players who evolve this art form today. Weaving firsthand reflections with historical insight and musical analysis, this book brings you closer to some of the most colorful personalities and compelling music that jazz has to offer. Each lively profile defines the player’s creative hallmarks in the world of jazz piano, whether achieved through a passion for expression, impeccable technique, stylistic flair, or penchant for invention. Doerschuk enhances his research with original interviews, plus incisive critiques of each player’s style and technique, pointing to exemplary recordings. Photos. DOES NOT INCLUDE CD. From Cuba to Puerto Rico to New York, an irresistible music began brewing in the 1940s. Mixing bebop-based improvisations with Cuban & African rhythms, inventive musicians such as American trumpeter Dizzy Gillespie & Cuban conguero Chano Pozo created a sizzling jazz style that still evolves today. Through anecdotal biographies & evocative photos, this large & comprehensive book portrays every key Afro-Cuban Jazz innovator past & present, plus other jazz artists influenced by this infectious music. You’ll also find reviews & ratings of 500 recordings that make (or don’t make) the cut, & essays packed with historical insight. “The largest & most comprehensive book on Afro-Cuban Jazz ever published.” Black & white photos. The infamous Chet Baker -- musician, junkie, and progenitor of West Coast cool jazz -- has always been an aloof mystery. Until now. His pure trumpeting, aching vocals, and classic renditions of many jazz standards all belie the turmoil of his private life. Baker dominated the jazz scene of the 1950s, working with the likes of Charlie Parker and Stan Kenton. By the sixties, however, he found himself caught in a downward spiral of heroin, cocaine, and prescription drugs, in and out of jail, and in and out of relationships -- this is his account. Throughout his life Chet returned again and again to the solace his music offered, to the haven of his trumpet’s smooth wail and his voice’s low croon. “Chet Baker has let us in, past the music right into his soul.” Carmen McRae is well known as one of jazz music’s most masterful improvisers, and is ranked among the greatest jazz singers of all time. She grew up during the swing era in Harlem, and participated in the transition from swing to bebop, playing with all the important musicians and in all the major clubs. Her struggle to fame finally paid off when she was 34 years old and began to perform with Tony Scott’s band. By 1955 she had signed with Decca records and achieved national recognition. 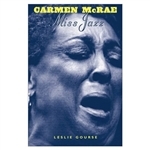 By the end of her life Carmen had performed all over the world, recorded over 60 albums, and been recognized with numerous awards and honors. She died in 1994. “The definitive story of this great woman’s incredible life and legendary work.” Photos. The text in this unique children’s book was inspired by renowned jazz saxophonist Charlie Parker’s recording of “A Night in Tunisia.” The rhythm and repetition of the words introduce young readers to a sense of jazz music. The full-color illustrations and whimsical type faces add to the creative humor. An ALA Notable Children’s Book, a “Publishers Weekly” Year’s Best Book, and an ”American Bookseller” Pick of the Lists. For ages 3-6, grades pre S-1. Born in 1917, John Birks Gillespie took to the trumpet at age 12. He joined his first big swing band as a teenager and promptly acquired the nickname Dizzy, a tribute to his boundless energy and fun-loving ways. He gradually freed himself from the limits of swing music in the late 1930s and thereby changed the course of jazz. Teaming up with several young musicians -- incl. drummer Kenny Clarke, pianist Thelonius Monk, and saxophonist Charlie Parker -- Gillespie developed a unique approach to rhythm and harmony that became known as bebop. He formed a large orchestra in 1945, and two years later, he introduced another new element, Afro-Cuban rhythms. His songs “Salt Peanuts” and “A Night in Tunisia” have become jazz standards. Photos. 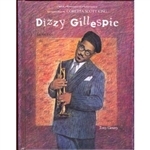 Dizzy Gillespie is one of the most expressive & virtuosic improvisers in the history of music. But he was much more than that. As one of the primary creators of the bebop & Afro-Cuban revolutions, he twice fundamentally changed the way jazz improvisation was done. And he transformed the aesthetic of big band jazz. This vivid biography takes us on the road with the great Calloway, Hines, & Eckstine bands & to Cheraw, S.C.’s cotton fields, Harlem’s’ after-hours clubs, the teeming 1940s N.Y. 52nd St. jazz scene, the rhythmic barrios of Havana, Rio’s samba festivals, the White House, & the world’s great concert halls as Dizzy teamed up with prodigious talents to make great music during a career spanning 55 years. Photos. Duke Ellington used his talents as both a bandleader and a composer to elevate jazz into a serious art form. Born in 1899, Ellington received very little formal musical training. Yet he made himself into an accomplished professional pianist by the time he graduated from high school. At the age of 28, Duke Ellington and His Orchestra began a successful engagement at Harlem’s celebrated Cotton Club. Making nationwide radio broadcasts from the club and recording hit songs such as “Mood Indigo” and “Take the A Train,” the band became the first black musicians to play Carnegie Hall and performed around the world for nearly half a century. Ellington wrote more than 2,000 compositions, incl. “It Don’t Mean a Thing,” “Satin Doll,” and “Sophisticated Lady.” Illus. Jazz, a uniquely American music that originated in the cultural melting pot of New Orleans, Louisiana, in the early part of the 20th century, has influenced many different musical & cultural styles. Yet this ever-changing musical style is also fraught with controversy: What exactly is jazz? And with its roots in the African-American music world, can non-African American musicians master its creative nuances? This book tells about the pioneering musicians whose artistic & musical talents helped shape the musical genre called jazz, & also about the controversies & debates that have swirled around the jazz world from its beginnings. Color & black & white photos. Born and raised in Harlem, Gloria Lynne won the Apollo Theater Amateur Hour at 15. She went on to perform with our country’s greatest jazz, blues, and R&B musicians and became one of America’s leading singer-songwriters. 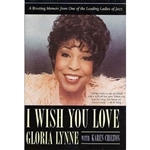 Gloria was the protégée of the renowned jazz singer Dinah Washington and learned the ropes from other great vocalists, such as Billie Holiday, Sarah Vaughan, and Carmen McRae. Like many black recording artists of the period, she suffered financially due to flawed recording contracts. “An important piece of American history, a first-hand account of the black music experience during the second half of the 20th century. “An inspiring story of a courageous woman overcoming terrible adversities.” Photos.